Sometimes the establishment needs a jolt of new, youthful, lively enthusiasm to remain fresh. That is where One Industries comes in. As a company that was formed by a small group of riders who all shared the same interests, they have worked to take off-road motorcycle gear to new heights. The brand new One Industries Gamma Raven MIPS Helmet is the first helmet that is equipped with the state-of-the-art Multi-Directional Impact Protection System. This layer of protection is geared to guard against the rotational forces that can be exerted on the skull in the event of a crash. 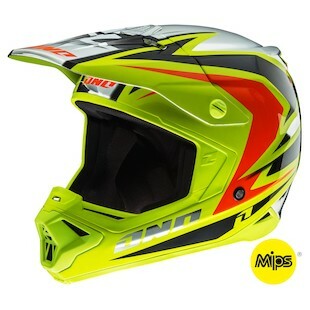 Placed between the moisture wicking Nylex liner, the EPS, and the outer shell, the MIPS system works to absorb shock as it moves less violently than the outer shell, thus transferring a lesser degree of force to the rider inside. From the large air intakes and fully channeled liner to the lightweight fiberglass shell, the One Industries Gamma series is an ECE and DOT rated helmet with a ton of great features. Built upon the same blueprint as the Raven, the One Industries Gamma Camber MIPS Helmet is another option that is available to riders looking for a different style. While the Raven is mainly Hi-Viz Yellow, the Camber offers a lively, yet more subdued graphic that comes in either Red/White or Navy/Cyan. 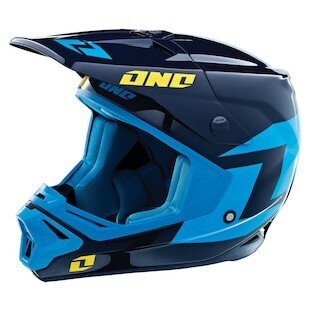 Great technology, premium features, and the attention to detail that a relatively new challenger brings to the game are all advantages afforded by the One Industries Gamma MIPS helmet. They advance, they progress, and they challenge the incumbency of old helmet thought processes at every turn.